I have to admit, when I started blogging, a post about the proper position while using the restroom was not on my list to write! Lately, I’ve come across research and resources that have convinced me that this is an important topic, and I’m going to attempt to address it while keeping the TMI to a minimum. The concept of squatting when defecating is not a new one. In fact, I was quite surprised the first couple of times I saw toilets designed for this purpose when traveling. At that time, I just considered it an outdated and primitive toilet, and couldn’t understand why anyone would use one. Fast forward a few years to my toothpaste and deodorant making, organic-cooking days and the concept actually makes a lot of sense. In fact, young children often do this naturally when eliminating (I can often tell when my one year old is about to need a diaper change because she is squatting down behind the couch). Recently, I’ve seen posts from everyone from Dr. Mercola to Dr. Oz touting the benefits of proper bathroom posture, and even Bill Gates recently held a contest to re-design the modern toilet. Experts point out that the squatting position is more natural and can help avoid colon disease, constipation, hemorrhoids, pelvic floor issues and similar ailments. Since Colon disease runs in my family and hemorrhoids and pelvic floor issues can often be an unfortunate side effect of pregnancy, I was willing to give it a try. The concept made a lot of sense to me, especially after seeing with myself and other laboring women, how relaxation and proper positioning of the sphincter muscles can make a night and day difference in labor (and babies are much bigger!). I’d noticed in the past how the relaxation techniques I used in labor (relaxing the jaw, etc) can help elimination be a lot easier, and it made sense that position would have an effect as well (as squatting often makes labor faster/easier as well). After reading several accounts of people whose elimination was greatly improved by simply changing their position, I attempted to try it their way and just squat on the toilet seat. Sounds easy enough, but when pregnant, it is not. Hilarity ensued. I was excited to have the chance to try the Squatty Potty, as it is much more convenient that trying to balance on the toilet seat (and more sanitary! ), and it looks a lot better than the empty coconut oil buckets I had tried using. What surprised me with the Squatty Potty was the immediate difference I noticed. The first time I used it, things moved much more quickly (there I go starting with the TMI). Within two days, this position felt so natural that it was strange to sit in the “normal position” anymore. Another advantage, as we currently have a newly potty-taught little one is that it is the perfect height for kids to use to climb up to the toilet. Between the Squatty Potty and the convertible toilet seat for little ones that we just installed, we’ve had a lot fewer “I-couldn’t-get-there-in-time” accidents. My husband is also very happy that we’ve gotten rid of the free standing kids potty, as it had gotten permanently gross after being used for multiple kids. Though I don’t struggle with constipation during pregnancy, (thank you probiotics!) I have struggled with hemorrhoids at the end of a couple of my pregnancies and my midwives are often reminding of the importance of maintaining pelvic floor strength since I’ve had my babies so close together. I’m excited to see what effect the Squatty Potty might have in both of these areas. 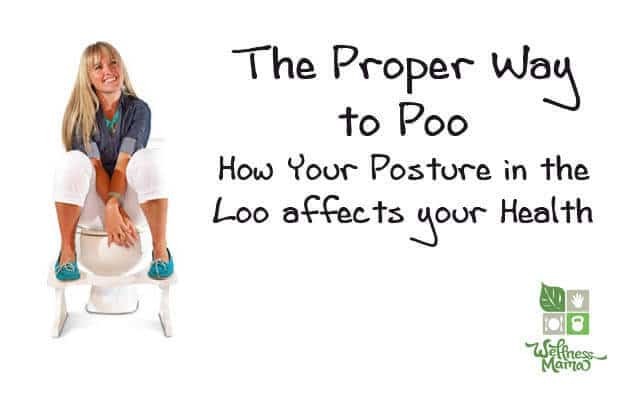 If you haven’t tried it, I’d definitely recommend modifying your restroom posture to see how it will effect your bowel health. I was surprised at the difference and think you will be too!